"Jedi Knight: Master and Student"
"Corruption Within: A Jedi's Struggle"
"Karis Amalia: A Hope and a Chance"
"Ascension: Rise of the Grand Master"
"The Battle for Naboo: Jedi Stand"
A young man born to a Legacy hundreds of years before his time, Ren Skywalker was raised on the world that is synonymous with his family: Tatooine. Raised by his grandmother in a slum in Mos Eisley, Ren never knew he was a Skywalker until the eve of his 20th birthday, in which his grandmother announced his name upon her deathbed, and ordered him to seek out the Jedi Master Tabris Longuine to begin his training as a Jedi Knight. Upon finding the Jedi Master Ren found out that his father, the former Grand Master of the Order; Robert, had fallen and was intent on destroying the galaxy once and for all. Told by the aging Jedi Master that it was a prophecy that Ren would kill Robert, Ren began his training as a Jedi Knight to end the threat to the galaxy, and under Mon Calamari, Ren did exactly that, redeeming his father and taking his rightful place as a Jedi Knight. Ren was born to his mother, Emilie Firestrider, and his father, Robert Skywalker, both young Padawans and lovers. Upon Ren's birth Robert was approached by a Seer, whose' name has been forgotten. She told the young Skywalker that his son would kill him by the will of the Force. Going into a rage, Robert stormed the birthing room by force, and his rage inadvertently wounded his girlfriend mortally, causing her to be put into suspended animation for many years (In which time she was thought to be dead). Upon seeing this Robert's rage increased, and he grabbed the infant by the leg, dragging Ren away to kill him. Tabris Longuine intervened at this moment, appealing to the goodness in the young Padawan to let his child go. Robert agreed and gave Tabris the child to hide from him, so he'd never be found by his wrath. Tabris hid Ren with his grandmother, Skiah, on Tatooine, where the warrior-woman raised Ren with strict morals. As the young child grew he was taught dozens of fighting techniques by his grandmother. The children around the boy disliked him, however, because of the intense feeling of pressure they'd feel near him. Unbeknown to all, this was the latent Force developing within the child, which emerged on his thirteenth birthday, when he was hit by a bully, and the bully promptly flew several dozen feet and slammed into a vendor's booth. Upon leaving Tatooine on the day his Grandmother died, Ren found Tabris Longuine and earnestly began to train under him intensely, the aged Jedi Master increasing the training regime of a Jedi Padawan by several dozen degrees due to the nature of the galactic crisis: Robert Skywalker, possibly the most powerful Force User in existence, was destroying it. Ren fought through the Jedi training with the determination seen only in his father before him, his power in the Force growing at an astronomical rate as he dug further into his latent power and skill. The young man soon became a genius with the Lightsaber, and a prodigy with the Force, but was unfortunately as hot-headed as his blood suggested. He confronted his father before he was ready, and Robert nearly killed the young man. It was only by the intervening of Seshmira Crosswind and her ship that Ren escaped that meeting alive. Soon after, Seshmira and Ren recognized their feelings for one another, falling deeply in love, and the young woman became Ren's balance and his refuge from the pressure of a galaxy depending on him. Returning to Tabris to continue his training, Ren furthered his skill further and further, until finally he knew he was ready. After experiencing a Force Vision that led him to the Valley of the Jedi, Ren was approached by his ancestors, including Luke and Anakin Skywalker. The ancient Skywalkers told Ren that he was the only hope for the future of the Jedi Order, and in the Nexus of the Light Side that the Valley created, they unlocked his full potential in the Force. Confronting his father under Mon Calamari when the Emperor's weapon was finally complete, Ren redeemed Robert, and the older Jedi saved his son and billions from certain death. After giving his father a proper funeral, Ren Skywalker looks to the future, now a Jedi Knight, and one day Grand Master of the Jedi Order. Cheered and regarded across the galaxy as the New Hero, Ren has a burden on his shoulders that he dutifully intends to carry. Three months after Ren's promotion to Jedi Knight, he was contacted by a young Jedi Youngling named Lann Karsten. The young man claimed to have been ending a mission rescuing a young girl, who he identified only as Maria. Ren found out very quickly that the young man was not a Padawan, but was being used by the Jedi Order to run small missions until he had a Master. Upon hearing this, Ren instantly realized that Tabris had sent the boy Ren's way for a hidden reason, but one Skywalker picked up on instantly: searching the currents of the Force, Ren could feel that Lann was to be his Padawan. Since that moment Ren began to train Lann Karsten, and Master and Padawan began an extremely close bond of friendship that would be tested as Ren drove the boy through the Jedi training; even going so far as to begin educating the Padawan in Form VII, something many Masters raised an eyebrow to. After about a year of training Lann, and Skywalker's ascension to Grand Master, Ren could no longer afford to have a Padawan in training. Choosing to accept the fact that he had nothing more to teach Lann, Ren promoted him to Jedi Knight. Their friendship remains strong. Almost a year after the ultimate redemption of Robert Skywalker and not three months after Ren's confrontation with Darth Imogen, the young Jedi Knight and his Padawan were sent on a diplomatic mission to Chiss space to secure an alliance with the Ascendancy against the threat of the Sith yet to come. Forced to land on a nearby moon outside of Chiss Airspace due to hostilities against the Republic, Ren and Lann were met by an old friend of Master Tabris Longuine; Council Member Karala. An aging woman in her mid-fifties, she seemed to share many of Ren and his former master's opinions regarding the Force and the Jedi Council as a whole, and thus she was one of the only Council Members trusted by the young Jedi. Entering diplomatic parlay with the Chiss Councilors was no easy task, but Ren soon won the respect of the Chiss representatives, negotiating a truce and an alliance with them against the enemy to come. However, as the deal was soon to be settled, the chambers were attacked by a small force of Sith Troopers, using Republic blasters. Leaving Master Karala to defend the Chiss, Ren and Lann quickly dispatched the invaders, only to return to find that Karala was in fact a Sith Lord, and the plan was to frame the Jedi Order in the death of the Chiss Senators. After dispatching the Sith in a desperate duel alongside Lann, Ren realized all too horribly that the Dark Side had penetrated the Jedi Order, and the Sith Archon quite possibly had the power to reduce the noble Jedi to nothing. Ren's trust of the Jedi Council took another blow, and he is now very wary of the actions of other Jedi, watching always for hints of Imogen's plan coming to fruition. After the incident in Chiss Space, Ren became nearly totally obsessed with Darth Imogen. He spent hours studying various histories, including those of his father, for information on her, and what may have brought about her fall. He came to the point where he very nearly knew almost every mission she'd been on as a Jedi Padawan to Celia Zatel, and studied in excess her actions, or what was known of them, beforehand. After hours of near exhaustion, he came to the mission that Celia Zatel and Thridi Montross took to the moon of Dxun, and read in detail how they'd emerged from the world as Darth Caelia, and Darth Imogen. Ren knew the moon possessed strong Dark Side energies, as it was so close to Onderon; a former world of the Sith. He also knew that the tomb of Freedon Nadd lay on Dxun, and assumed that the solution to the problem lay there. If he could find how Imogen had fallen, he assumed he could find her weakness at the root of her fall. Setting out with all speed, his eager Padawan following, Ren launched to Dxun with eagerness, prepared to do whatever it took to put a face to his enemy beyond the mask of hatred he knew. Upon arrival, both Master and Apprentice could feel the sheer Darkness the moon possessed, and Ren insisted Lann rest and prepare himself for a long, hard sojourn. While Lann slept, the Jedi Knight set out into the Jungle alone, and after a small trek stumbled upon his father's former wife's house. In a fit of grief born rage she attacked him, and Ren fought her off; and in the process recovered his father's lightsaber with the idea of rebuilding his weapon with his crystal. It would be a symbol that the old Grand Master fought on with his son. After this both unfortunate and fortunate turn of events, Ren marched onwards into the woods; hopelessly lost. As he walked deeper and deeper, sure that the Force would guide him out, he stumbled upon a great feeling of hatred, darkness, and despair. A Sith Lord of great power was nearby. Tracking the feeling down, as he felt compelled to do, he found the source was a long time thorn in the side of the Jedi: Karis Amalia. A former Council Member herself and long time Sith Lord. Amalia was recovering from a recent battle, and though she was reluctant at first to engage the young Jedi in a duel, Ren felt a point needed to be made, as he saw a potential for something akin to…redemption. He goaded her into battle, showing her his father's lightsaber, and in a fit of rage she struck at him. As powerful as he was in combat, the duel was very short and fierce. Amalia had never been an expert with a lightsaber; her power lay in healing and in strategy. He quickly disarmed her, and after questioning her use of hatred and power, he renounced it and stated very sincerely that the ultimate power was love. Love, he stated, could never be understood by the Dark Side, and it was one of the reasons why he had defeated her. The Sith Lord was shocked and compelled by his arguments, and moreso shocked by the fact that he had not killed her; as his father would have done. A respect grew between the two, and Karis swore she would meet him again…perhaps on better terms. Upon returning from Chiss space and his mission on Dxun, Ren reported his findings to the Jedi Council. After deliberation, the Jedi Council found faith in Ren's growing power and promoted him to a Jedi Master on the spot; a rather unorthodox decision on their part. However, though Imogen's intentions were obviously threatening to border Republic worlds, the Grand Council chose to stand by and watch and wait, instead of answering with immediate action. This infuriated the young Jedi Master, and after a long tirade of insults in the Councils' face, he left in a storm. Ren's first actions were swift; he reformed the Jedi Council and in one swift stroke organized Jedi expedition and attack teams to accompany the Republic Armies and Navy and fight alongside them against the Sith threat. After initial stalemates in the war on the Outer Rim, the Sith undertook a bold attack: Hammering into the peaceful world of Naboo, presumably to take indoctrinated workers to aid in the furthering of the Sith War Machine. Because Naboo was inconsequential to the Republic war effort, the Senate officially left the planet to the wolves, but Ren, already planetside on personal business, refused to. Calling up a force of 200 Jedi Knights and Masters, Ren began a guerrilla war against Sith forces on the planet, disabling Sith supply lines and hopefully crippling the war effort until Republic forces could arrive from other contested areas to provide support. Ren Skywalker is extremely kind, gentle, and hard to anger. He is known to be furiously loyal to his friends and allies, especially his fiancee, Seshmira Crosswind. He also believes incorruptibly in the rightness of the Jedi Order and the Light Side of the Force, and is quick to help when he is needed. However, like his former Master Tabris Longuine Ren often disagrees with the Jedi Council and has been openly defiant of them, which was made publicly apparent in his acceptance of Lann Karsten as his Padawan Learner without Council approval. Ren believes very strongly, almost mirroring his master, that all things happen for a reason, and the will of the Force is to be served over the will of more corruptible mortals. -Soresu: Tabris began Ren's lightsaber training not with Shii-Cho, which to other Jedi Masters seemed rather unorthodox. Tabris believed strongly however that with the martial training that Skywalker had received from his grandmother that the young man could grasp the basics fairly easily and thus launched him forward. Ren struggled with the tight, fast movements of the art of deflection at first, but after several attempts was finally able to maneuver in formations and webs that would keep blaster bolts from ending him. Although Ren is fluent in this form it is his least preferred of them all. -Ataru: Ren embraced this form with gusto and complete dedication, launching himself into the Aggression Form. He practiced night and day, nearly burning himself into a state of exhaustion that only Seshmira Crosswind managed to convince him to relax from. It is this form that Skywalker feels most comfortable in, and those who have seen Ren employ the Way of the Hawk bat state that he is a nightmare, his strong offensive based Force powers complimenting the demands of the art perfectly. It was this form he employed against the Sith Archon Darth Imogen on Nar Shadaa after becoming a Jedi Knight, meeting her furious offensive strikes with a strong offense all of his own. With the speed of the two combatants the result of the combat was a draw; both parties leaving a mark on the other and unable to continue due to sheer exhaustion from such exertion. -Juyo/Vaapad: After the battle against Darth Imogen ended in a stalemate, Skywalker came to the conclusion, though it was hard to accept, that his favored form Ataru would not be enough to defeat the Sith Lord. Ren earnestly began to search archives and holocrons, looking for anything that could help. He studied every other form in reading, including Djem-so, which was the favored form of his ancestors Luke, and Anakin. The form didn't appeal to him, but very soon the young man stumbled upon a holocron report of the duel between Darth Sidious and Mace Windu. Ren read with great interest about how the old High Master had used the Juyo/Vaapad form to absorb the Sith Lord's powers and use them against him. He also noted with ever increasing interest that the form was, in his opinion, a bridge away from Ataru. Tabris Longuine cautioned Ren that form VII could lead to the Dark Side if the user wasn't strong willed to fight the temptations of its power, but Ren assuaged his old Master's fears with the promise that he would not fall. Ren threw himself into Juyo with the same dedication he had had learning Ataru, and quickly found an affinity to the chaotic movements of the Ferocity Form. Ren continues to practice the form, attempting to perfect it as only one other Jedi Master has in the past…and use it to destroy the Sith Archon once and for all. Ren was pleased to find this form paid off when, during a joint duel with Joga Crosswind against the Sith Darth Tremor, the Jedi Master was knocked aside by the Sith's fury. Ren, much to Tremor's surprise, was able to continue pushing the Sith Lord back despite Tremor's attempts to kill what he thought was an inferior opponent. 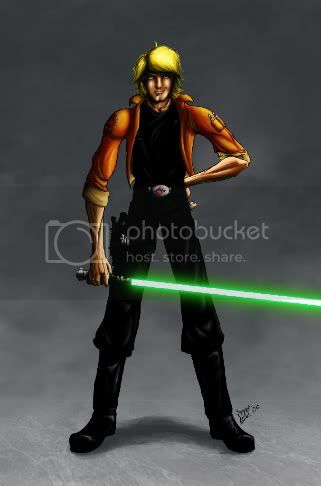 Using a combination of Juyo and his favored Ataru, Ren was able to destroy a portion of Tremor's saberstaff, and with a kick to the stunned man's face sent the injured Sith Lord back in the direction of the rejuvenated Joga, who promptly ended the duel by destroying the other half of the Sith's weapon. Ren, though only a Jedi Knight, was the only warrior to escape the battle uninjured, and was now totally confident in his abilities with Form VII. Imogen and Skywalker's duel was, as noted, a stalemate, but none who had ever faced the Sith Lord at the height of her power had survived to tell the tale, most notably Darth Caelia (Formerly Celia Zatel). The stalemate was of great frustration to both combatants, and would lead to Ren's study of Form VII. However, despite his ferocity in combat Ren's skills stay firmly within the Light and many believe that Ren will become a Jedi Weaponmaster before his final ascension to Grand Master, which many hope will come soon. If Ren had a weakness it would be his compassion for all living things. He ultimately believes that no matter how Dark one is, one can be redeemed to the Light. His loving nature prevents him from truly believing one can ever be fully lost, and were it in his power of persuasion to do so, he would attempt to redeem even Imogen herself. Ren also has very little patience for those who believe they are entitled to his or anyone else's loyalty, as he believes that only those who do not desire loyalty are to be given it. Ren looks much like his ancestor Luke, but has longer hair, with the more recent addition of a long crescent shaped scar extending from behind his eye to the back of his jaw, courtesy of his duel with Darth Imogen. Skywalker often wears black Jedi Robes, if not his favored Jedi Air Squadron flight jacket, pants, and boots. Ren is proficient with a blaster, but since taking up the lightsaber of the Jedi Order has become an expert in the elegant weapon of the Knights and has given up the cold weapons of normality. He possesses what he claims to be the ancient ship of his ancestors, Luke and Mara Jade Skywalker, the Jade Shadow, but while the ship looks much like the ancient ship and has many of its still high tech upgrades, this is unverified. Also, being as the ship possesses a plethora of modern equipment, it makes this identity unlikely but a possibility. Besides, anyone who knew Ren wouldn't have suspected him of lying. It is entirely possible that even if the ship isn't the Shadow, Skywalker wholly believes it to be. 335 ABY Ren Skywalker's grandmother reveals to him his name, his father, and his destiny. Ren leaves to train as a Jedi Knight. 335 ABY Ren faces his father, and redeems him on his deathbed. Ren Skywalker becomes a Jedi Knight. 335 ABY Ren faces the Sith Archon, Darth Imogen, and both warriors leave thier mark on one another, creating a bond of adversity that will last far into the future…. 336 ABY Ren takes Lann Karsten as his Padawan Learner. 337 ABY Skywalker and his Padawan are involved in the Chiss Betrayal, and come home empty handed due to Sith involvement. 337 ABY After hours of research Ren sets off to Dxun to find the cause of Imogen's fall, and in the process recovers his father's lightsaber and meets Karis Amalia.